Reprinted from the Winter 2002 Journal of the South Carolina Native Plant Society, and used by permission. To see additional pictures or information about a particular plant, click its name or picture. Stevens Creek Heritage Preserve, located in McCormick County [South Carolina], is beyond a doubt the premier site to visit and photograph spring ephemerals in the Midstate. The preserve has a combination of extraordinary color and rare species which can be seen nowhere else in the state. This site is a must-see for all wildflower enthusiasts. My favorite time to visit is from mid-March thru early April. To reach Stevens Creek Preserve, take highway 221 south of Modoc and Hamilton Branch State Park to the community of Clarks Hill, turn west onto county route 420 past Laurel Grove Church to County Route 88. Then turn left onto 88 and continue towards the Edgefield County line, the preserve is located on the north side of the road. The site is marked by a Heritage Trust Preserve sign and a small parking area. This area is unique because of the unusual underlying bedrock. The slopes of the preserve are nestled on top of marble and some outcroppings of this unusual calcareous rock are visible on the preserve. This rock weathers to produce a high pH soil with ample amounts of calcium, allowing numerous rare species to grow. The site has been known as an outstanding botanical location for many years and was visited and made famous in the 1950's by A.E. Radford (one of the authors of the Flora of the Carolinas ). A trail winds through the preserve starting from the west comer of the parking lot. Because this rare woodland community is so rare and fragile, you should be sure to stay on the trail and not trample the fragile vegetation. Believe me, you can see it all from the trail. The trail begins by winding through young pine and oak communities with little sign of the rich woodlands to come. Some interesting species are first noted growing around small rock outcrops. You might spot the unusual little Hairy Spiderwort (Tradescantia hirsuticaulis) growing here, as well as the Aromatic Sumac (Rhus aromatica). The Sumac looks similar to Poison Oak (Toxicodendron pubescens) with its trifoliate leaves. Unlike the Poison Oak, this small shrub is completely harmless; it is a good indicator of high calcium soils and the first sign of what is to come. The trail comes to the edge of a steep slope and here you first get a chance to see some of the real stars of the area. At the top and mid-points of the slope you will notice a very unusual shrub. It will be in bloom and fruit if you visit in mid to late March. This shrub is the federally threatened Lake Miccosukee Gooseberry (Ribes echinellum). This extremely rare shrub is known from two areas worldwide, this region of SC and along Lake Miccosukee in the Florida Panhandle. This is South Carolina's only native Gooseberry. The species is distinctive because of the spiny fruit it produces. 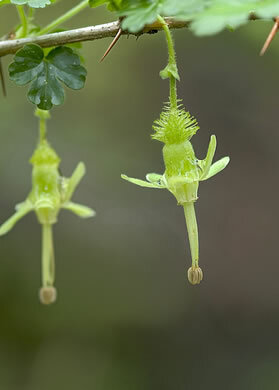 While not really showy, it is bizarre with dainty greenish flowers like dangling ballerinas. Most Gooseberry species are found in high elevation or northern forests and this one is a remnant of colder climates in our area during the glacial periods. It is now limited to rich, cool slopes where it can still manage to avoid the surrounding hot and drier landscape. The tree species begin to change here also with Red Oaks, American Beech, Chalk Maple and Southern Sugar Maple becoming more abundant. Towards the base of this slope, an unusual sedge may be found growing in scattered clumps. This is Carex superata, a species that was only described a few years ago. As you reach the bottom of the slopes your world truly changes! Now you are standing in one of the most diverse and rich woodlands to be found in South Carolina and all around you are beautiful spring ephemerals in profusion. 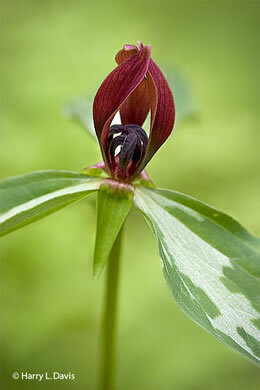 Among the most notable of these are the Trillium found scattered along the bases of the slopes. The Lance-leaved Trillium is among the most peculiar, with its extremely narrow, “flame-like” twisted petals. 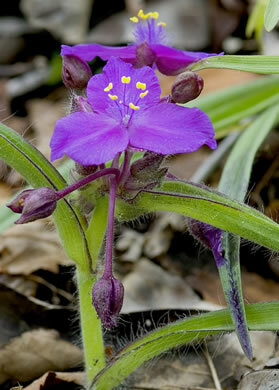 This is a sessile-flowered species with purple, brownish or reddish colored flowers. It is limited to only a handful of sites in South Carolina and is rare globally. This is the largest population we have. Another sessile-flowered species, the Savannah River Trillium (Trillium discolor), is found here also. 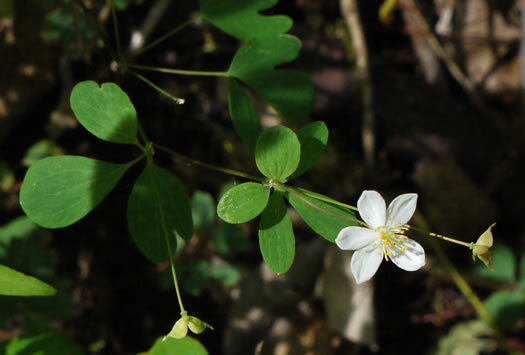 It fills the woodlands with its unusual clove-scent and cream-colored sessile flowers. This is the southern limit for this species, which is more abundant in the Savannah River drainage of the Upstate. Not all the Trillium here are of the sessile-flowered persuasion. Another unusual species is the Southern Nodding Trillium (Trillium rugelii) that may be found along these. slopes. This species sports nodding white flowers, but you will not notice the flower at all unless you peer under the umbrella-like leaves. 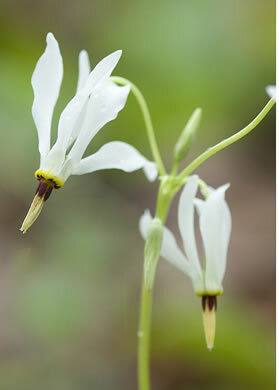 Tlillium are not the only stars in this show and many other beautiful species are to be found here. 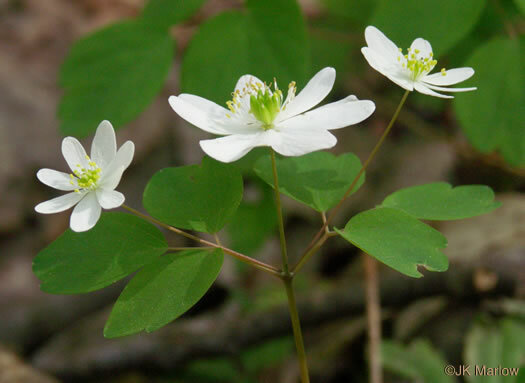 An easily overlooked species found here and nowhere else in our state is the False Rue Anemone (Enemion biternatum). This species is not hard to spot but is often confused with the very similar Windflower (Thalictrum thalictroides) that is also found here though in lower abundance. You would have to be blind to miss the Shooting Star (Dodecatheon meadia), whose bright white downward pointing flowers are so unusual that I could spend hours just gazing at them. This species is also limited in South Carolina to a very few sites with high calcium soils. Near the top of the slopes you might notice the white flowers of the Mock Orange (Philadelphus inodorus and P. hirsutus) adding color to another layer of the forest. Another taller showy species is the Silverbell Tree (Halesia tetraptera). One fine specimen that usually flowers profusely may be seen right above the trail. 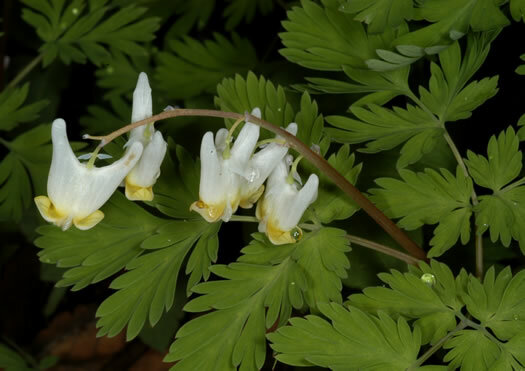 Another peculiar species found here is the Dutchman's Breeches (Dicentra cucullaria). The flowers of this species, which look for all the world like little pairs of white pants hung out to dry, are well known to northern botanists but are a rare delight to South Carolinians and may only be seen here in our state. Less obvious is the odd Weak Nettle (Urtica chamaedryoides) with its narrow whorled leaves. Until recently, this was thought to be the only location for this species in the Carolinas, but now it has been found at a handful of other locations in South Carolina and along the Roanoke River in North Carolina. The woods are full of sedge species, but most unusual of these is James’ Sedge (Carex jamesii), which in South Carolina is only to be found here. It is more typical of limestone woods in the Midwestern United States. It was first located here in 1993, despite the fact that it is common at the site. The trail continues, winding around the bases of these slopes and across parts of the floodplain and then back into the uplands. As you move back into the uplands be sure to look for the rose-colored flowers of the Tuberous Gromwell (Lithospermum tuberosum). This species is in the Borage family and produces scorpoid cymes (meaning the inflorescences uncurl like a scorpion's tail). Be sure to allot a good three-hour period or more to enjoy this area and don’t be in too much of a hurry. Though the trail is rather short, the diversity is stunning and the longer you spend looking the more you find. Every time I return to this magical forest wonderland I find something I never noticed before, and I have visited the site no less than 30 times! Remember that alI of these species and the community here are very fragile and protected, do not collect flowers and try not to trample the vegetation. Don't miss Stevens Creek this spring or in my opinion you will have missed spring altogether. * Dr. McMillan is a professional naturalist, lecturer, director of the South Carolina Botanical Garden and the Campbell Museum of Natural History at Clemson University, and the host, co-creator, and writer of the award-winning ETV nature series Expeditions with Patrick McMillan .